The United States Congress designated the Funeral Mountains Wilderness (map) in 1994 and it now has a total of 25,707 acres. All of this wilderness is located in California and is managed by the Bureau of Land Management. 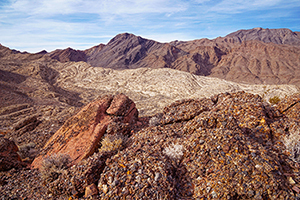 The Funeral Mountains Wilderness is bordered by the Death Valley Wilderness to the west. Despite the dreary name, rugged and cheerfully colorful limestone lies in striking bands across Funeral Mountains Wilderness. From the southeast and Nevada, the long alluvial slopes of the Amargosa Desert ascend into the Funeral Mountains, which extend northwest into Death Valley National Park. Elevations range from about 2,200 feet to Bat Mountain's 4,950 feet. Desert bighorn sheep have been spotted in the peaks, but very few humans ever travel into this dry, desolate, and trail-free country. Planning to Visit the Funeral Mountains Wilderness? How to follow the seven standard Leave No Trace principles differs in different parts of the country (desert vs. Rocky Mountains). Click on any of the principles listed below to learn more about how they apply in the Funeral Mountains Wilderness.